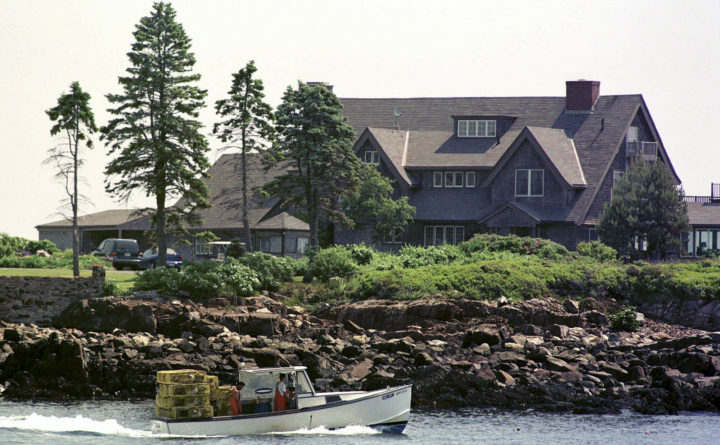 A lobster boat works in front of Walker's Point, the seaside home of former President George H.W. Bush, in Kennebunkport, June 8, 1999. The former first couple's children, grandchildren and great-grandchildren are expected to continue to enjoy stunning views, fishing, golfing and swimming each summer at the oceanfront home even after the death the former president in November 2018, and of his wife Barbara several months earlier. KENNEBUNKPORT, Maine — “Poppy” and “Bar” are gone, but the passing of George H. W. and Barbara Bush won’t mean an end to children’s laughter, splashing in the pool, barking dogs or clinking horseshoes at the family’s property on the Maine coast. The former first couple’s children, grandchildren and great-grandchildren will continue to enjoy stunning views, fishing, golfing and swimming each summer at their oceanfront home, just as previous generations have. The Walker’s Point property became known as the “Summer White House” when Bush was president, elevating the sleepy coastal community’s status and making it a household name thanks to high-profile visits by world leaders, political protests and swarming journalists. The three-story, stone-and-shingle residence overlooking the Atlantic Ocean frequently served as a backdrop for reports on the nightly news. In addition to that main house, there are eight other buildings, including homes for all five of Bush’s children: former President George W. Bush, former Florida Gov. Jeb Bush, Dorothy “Doro” Bush Koch, Neil Bush and Marvin Bush. There’s also a swimming pool, a tennis court and an art studio for George W. Bush. And, of course, there’s a horseshoe pit for George H.W. Bush. The nation’s 41st president died last month at 94 in Houston and was laid to rest Thursday in College Station, Texas. His wife died about eight months ago at 92. Bush spent part of every summer at Walker’s Point since childhood with the exception of during World War II when he was a naval aviator. His wish was for the family’s future generations to enjoy the property the same way he did, said Freddy Ford, chief of staff to his son, former President George W. Bush. “Forty-one’s wishes were for the family to enjoy his beloved Walker’s Point for generations, and that’s just what they’ll do,” Ford said in a statement. “It will be very active, and very alive, as 41 would like it,” he said. Paine, whose husband gave painting lessons to George W. Bush, said there was no telling who you’d encounter when paying a visit to the home. There might be local residents, a celebrity or a world leader hanging out. And there was always family around. She recalled visiting when the Bush granddaughters, Jenna and Barbara, were scooting around on tricycles. “There’s no way that the family members are going to let it go,” she said. Walker’s Point is made up of three different properties, all of them owned by the same limited family partnership. The assessed value is $13.5 million, town officials say. For local residents, one of the biggest changes may be a shift in the level of security, said Town Manager Laurie Smith. Secret Service agents stayed on site during the summer when the Bushes were in Maine, maintained a checkpoint on the property and lived in the community.